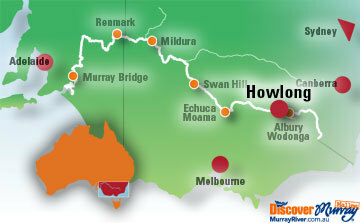 The scenic approaches to the border town of Howlong follow the winding River Murray and billabongs festooned with pelicans and waterfowl. This is mixed farming country where tell-tale mullock heaps stand witness to the days when miners wrung gold from the ground. Today the area's wealth flows from the liquid gold squeezed from the grapes of the Rutherglen. Rutherglen lies 21km south-west of Howlong and village sign posts give directions to the individual wineries. The Rutherglen patch is acknowledged as the most important wine-growing area in Victoria and its vineyards consistently produce some of Australia's finest table and fortified wines.